We can convert your UniSearch ComSquared documents MO Disks to PDF TIFF or JPEG so that you can easily access those files by Windows System Software. UNISearch is an electronic document management systems - also known as ImageDirector EDMS, namely computer software app for capturing, indexing, storing, searching, retrieving, displaying and distributing computer generated data and scanned and faxed images and accompanying documentation. Newer products by Milner include ImageDirector-MFP, ImageDirector-Capture ST, Fax Capture, YourSecurePoint, NETSearch. UNISearch applications stored data on optical disks (COLD Report technology).COLD (Computer Output to Laser Disk [and to other media]) means the majority of data is stored by writing documents onto MO / Optical / CD-ROM disks. Documents are automatically indexed and filtered according to ASCII or image formats, and the system can have optical drive jukeboxes with capacities ranging from hundreds of gigabytes to terabytes. Many of our customers looking to move to newer Enterprise Content Management (ECM) software and storage library systems, or simply eliminate proprietary systems and view documents on Windows or Apple Mac PC with no specialised software ie. PDF, Word .doc .docx, JPEG, Excel .xls .xlsx, Access Database, .csv. Unisearch MO Disks Convert Import Extract and Recover Files PDF TIFF Scanner Documents problems that we recover data from are listed below. Unisearch MO Disks conversions, Convert Unisearch MO disks, Extract Unisearch and Recover Files PDF TIFF Scanner Documents. 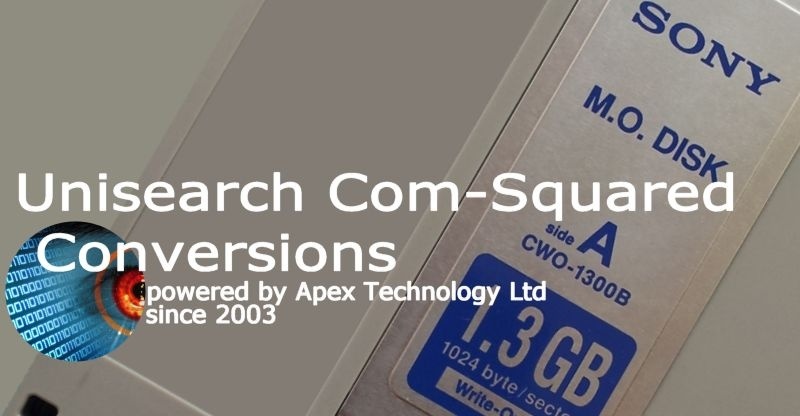 Unisearch ComSquared MO Disks Convert Import Extract and Recover Files PDF TIFF Scanner Documents Management System on Sun IBM AIX Milner ImageDirector Fax..